While most pro-immigrant activists are focusing on educating people about President Obama’s new immigration policy regarding DREAM Act students, which promises to stop the deportations of some undocumented youth, the local human-rights group Puente is advocating a halt to all immigration deportations. And to convey that defiant message, Puente is planning to gather about 40 undocumented immigrants and travel via bus across the country, visiting cities in the Southwest along the way. The trip will begin July 29 in Phoenix and end at the Democratic National Convention in North Carolina, which is scheduled to begin September 4. “[We’re] challenging either places that have passed similar legislation [as Arizona’s Senate Bill 1070] or [have anti-immigrant] sheriffs, or places that there is current [immigrant-community] struggle,” says Puente organizer Carlos Garcia. The “undocubus,” as Garcia calls it, will include undocumented aliens who live in Arizona, Texas, Colorado and New Mexico. The irony of a bus trip for aliens already at risk for being bussed to the the border if deported is intentional, according to Garcia. The point? To show the Democratic Party that President Obama is as bad as Maricopa County Sheriff Joe Arpaio when it comes to immigration enforcement. After all, the activists correctly observe, the Obama administration has deported more than 1 million immigrants since 2009. And if Obama wins a second term in November, another million could be shipped home. One day before the “undocubus” departs, Puente will sponsor a “March for Dignity,” beginning 9 a.m. at Phoenix’s Indian Steele Park and ending at the local offices for the U.S. Immigration and Customs Enforcement. The demonstration will highlight the collaboration between local law enforcement and immigration officials in deporting undocumented immigrants, Garcia says. 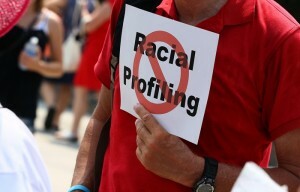 Another twist could come if Sheriff Arpaio testifies in the federal racial profiling lawsuit Melendres v. Arpaio. The trial in Melendres is scheduled to start July 19 before Judge G. Murray Snow at the Sandra Day O’Connor U.S. Courthouse in downtown Phoenix. 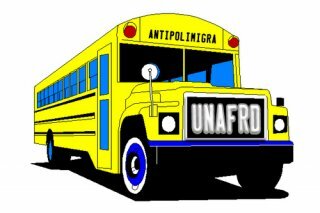 Should Arpaio testify before the undocubus heads for North Carolina, its passengers will publicly out themselves as illegal in a demonstration to take place in front of the federal courthouse, as Arpaio is testifying. They may be here illegally, but as the U.S. Supreme court recently noted, this is not a crime in and of itself. However, in racial-profiling, Arpaio has violated the highest law in the land — the U.S. Constitution. As Puente constantly reminds the public, Arpaio is the real criminal, not those in this country struggling to survive. This entry was posted in Events on July 23, 2012 by Ian. On Tuesday, the District of Columbia City Council unanimously approved a bill that will limit the circumstances under which local law enforcement is required to hold individuals at the request of Immigration and Customs Enforcement (ICE). The effort undermines the federal Secure Communities program, which requires local law enforcement to share fingerprints with federal immigration officials. If an individual’s fingerprints show up in a Department of Homeland Security Database, ICE can ask local law enforcement to detain the individual for 48 hours so it can take the person into custody. The newly-approved law restricts the period in which immigrants will be held from 48 to 24 hours, requires that ICE pay the local costs of incarceration and specifies that those held on detainers must have been convicted of serious crimes. The city of Chicago is on its way towards joining D.C. and easing federal immigration enforcement within city limits. Mayor Rahm Emanuel (D) announced on Tuesday that he will also propose an ordinance that would restrict the circumstances in which local law enforcement can turn undocumented immigrants over to federal immigration authorities, noting that they would only be able to do so cases where the immigrants have serious criminal convictions or outstanding criminal warrants. D.C. and Chicago are not the only places where officials are fighting back against harsh immigration laws. Last week, California state senators approved the Trust Act, which is designed protect undocumented immigrants and push back against Secure Communities. The bill, awaiting action in the Assembly, would prevent local law enforcement officials from referring a detainee to ICE unless the person detained has been convicted of a violent or serious felony. This entry was posted in Events, Press Coverage on July 11, 2012 by Ian. 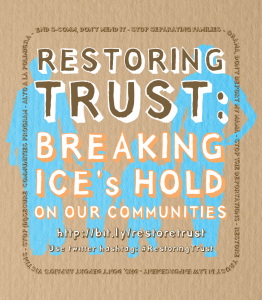 The Restoring Trust campaign urges local officials to not be accomplices to detention and deportation. Specifically we ask them to not comply with voluntary requests from ICE to hold and turn over people for deportation. A growing number of cities have enacted these progressive policies,including Washington DC, Santa Clara, CA, and Cook County, Illinois and more. Together we’re forging an alternative to the Arizonification of our country. Host a community educational event. Date/ Time of Event: Thursday, July 12, 2012, 1:00 – 4:00 p.m. Description: Forum on deportations in our local jails. Speakers include law professors, elected officials, and law enforcement. This entry was posted in Events, Resources on July 9, 2012 by Ian. No S-Comm in New York! Come Protest Next Monday, May 14, 2012! Under S-Comm, local law enforcement send fingerprints of arrestees to the Department of Homeland Security database. 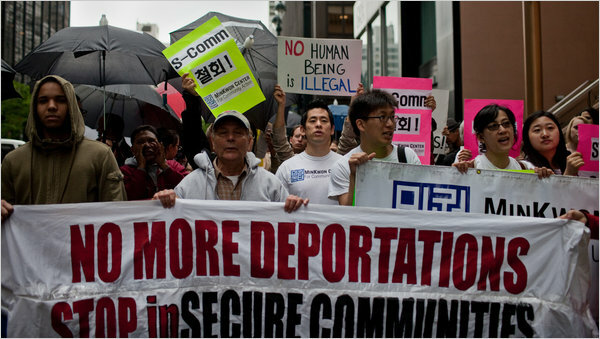 This program will push even more immigrants into the unjust detention and deportation system, On June 1, 2011, Governor Andrew Cuomo suspended S-Comm in New York. But Immigration and Customs Enforcement (ICE) just announced that it would be activating its fundamentally flawed S-Comm program throughout the state on May 15. Join us in our call for an end to S-Comm! ALTO a Las Comunidades Seguras Ahora! Bajo el programa de “Comunidades Seguras,” la policía local envía las huellas digitales a bancos de información de las personas arrestadas. Este programa empujará a más inmigrantes dentro del sistema injusto de detención y deportación. En el 1 junio del 2011, el Gobernador Cuomo suspendió el programa de “Comunidades Seguras.” Pero la Migra anunció que el fallido programa se implementará a través del estado el 15 de mayo. Los invitamos a que se unan a parar este programa. Auspiciado por (lista en formación): El Proyecto de Defensa al Inmigrante, Se Hace Camino NY, Grupo de Trabajo del Estado en Contra de las Deportaciones, Coalición de Inmigración en Nueva York, La Unión De Libertades Civiles de Nueva York. This entry was posted in Events (New York), Featured, Organizing Resources on May 11, 2012 by Ian. Petition: "End S-Comm! Don't Mend It"
End S-Comm, Don’t Mend it! 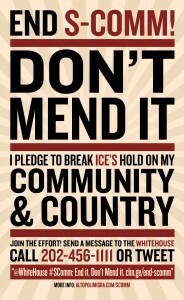 I pledge to break ICE’s hold on my community and my country. I will continue to demand that the federal government end the in-Secure Communities program that has deported over 169,000 mothers, fathers, sisters, and brothers, and threatened the public safety of us all. I will demand that my local and state governments refuse to be deportation pipelines. I will urge my local and state officials to adopt policies to deny ICE access to individuals and deny voluntary ICE holds requests. I will ask them to rebuild trust. I will not stop. This entry was posted in Events, Media, Organizing Resources on March 26, 2012 by Ian.